This topic contains 144 replies, has 5 voices, and was last updated by Jefaris 3 months ago. The next morning greeted the companions to a hearty send off breakfast from Danruu and Dela featuring eggs, bacon, and a pile of toast and jam and honey, all to be washed down with a hot mug of klava. Even Mia is seen going about her daily chores as if the previous four days had never happened. “Remember you will always have a place here any time,” Danruu said as the group was finishing up breakfast and gathering to leave. 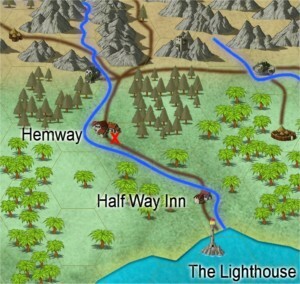 The first day of their journey towards Hemway went much like the path leading up to the inn from the lighthouse. They saw several more bunya bunya trees, even a few cherimoya trees mixed in with the flowering mimosa tree with their sunburst like flowers, and the royal poinciana competing for attention with its flamboyant display of colors. As they made camp for the night the second day brought them into a new mix of trees, the Marsipian Cypress tree. Thick groves of them grew along the Northern side of the road. It was this very tree that was the key to Marsipal’s rise in power. The Marsipian Cypress produced a light tan lumber that was ideal for ship building. It’s natural resin produced a distinctive odor that made it resistant to termites and rot making the wood highly durable. This wood, along with the impressive skills of Marsipian shipwrights, made the island of Marsipal the dominant sea power in all of Tera’Fir, surpassing even Asgra in its naval prowess. The lives of most Marsipians are dominated in one aspect or another by the sea. They are typically either sailors, fishermen, traders, ship builders, or in logging to provide the resources for the building of ships. The Marsipians are a prosperous people with most of their wealth coming from trade and the export of lumber harvested from cypress trees that grow abundantly on the island. The group passed a few logging camps and farms as they neared Hemway towards the evening of their second day. 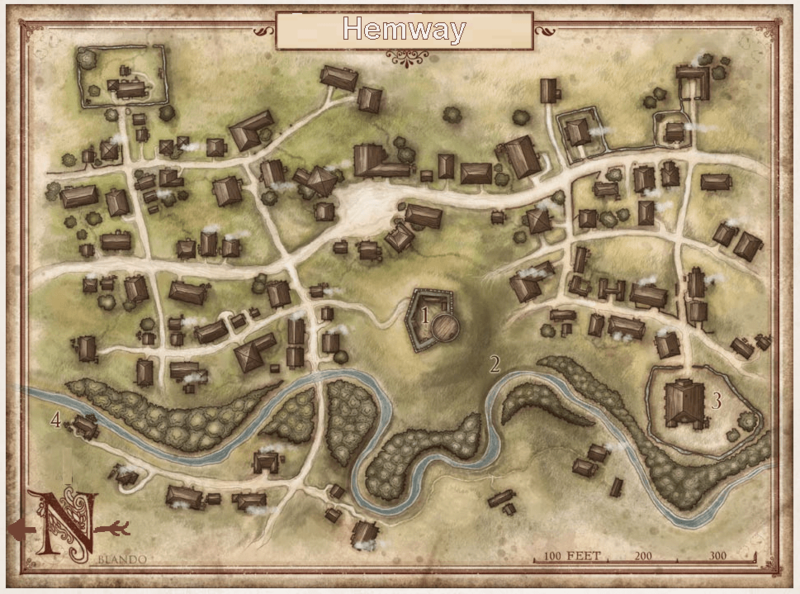 As sundown approaches the group entered the outskirts of town, passing a few homes and settlements as they approached Hemway itself. But something is wrong. Columns of black smoke suddenly start to rise from a few distant buildings near the other end of the town, and running figures could be seen scattering about the streets. 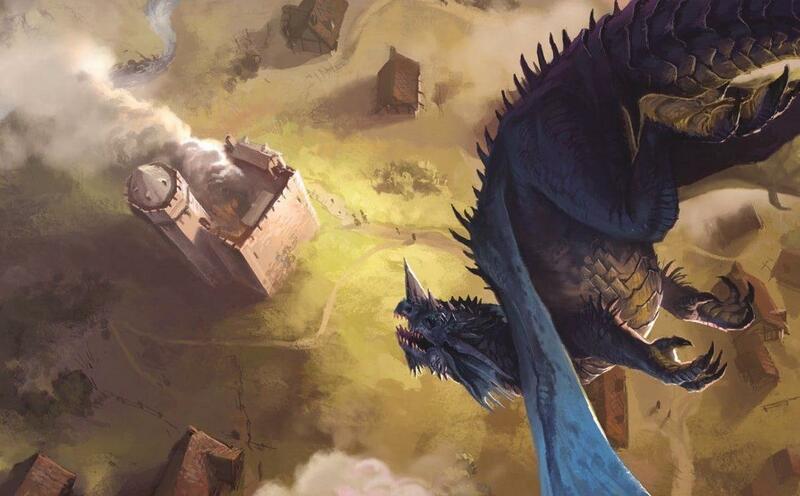 Then a dark, winged shape swooped low over the keep that rose above the center of the town and then disappeared off into the distance. alley on the family’s heels and fan out around the woman, who looked determined to delay the creatures for as long as possible as the other’s made their escape. This topic was modified 7 months, 1 week ago by Mormy. You are entering the town from the main road at the top right of the map. Marked on the map as “1” is the keep which is in the center of town and clearly visible since it is on a hill. 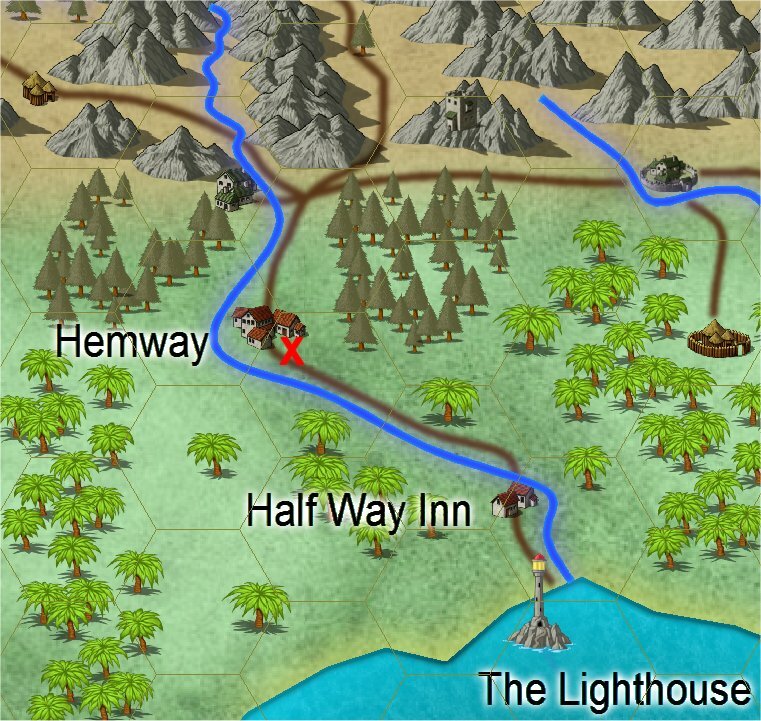 The fleeing townsfolk seem to be mostly running in that direction. This reply was modified 7 months, 1 week ago by Mormy. The reptilian creatures snapped and hissed at the woman as they slowly collapsed their half-circle, one feinting on the left, then another on the right, ever closer . Desperation granted her more courage than she felt, knowing every second gave her family that much more a chance to escape to safety and so she stood her ground, fending them off with jabs of the jagged haft of her broken spear and ducking behind the protection of her round shield. Then suddenly another figure burst from the shadowy alley between the houses and sped toward the scaly pack hunters, dashing at an impressive speed to the aid of the beleaguered mother. The would-be rescuer was a human male dressed in ordinary garb, but as he neared the backs of the woman’s assailants two short blades appeared in his hands, glinting dully in the reddish light of the setting sun. He lashed out at the closest foe in a whirling display of blades and coat and sash, slicing the reptilian adversary deeply across the chest and neatly puncturing its abdomen. With a certainty of purpose he pivoted to face his next opponent, blood of the first victim dripping lazily from his swords. “Leave the woman alone,” he said in a commanding tone, challenge glinting in his dark eyes. “Well this is a fine welcome”, Fenella said as she grasped her staff in her hand glad she had cast shaleigh on it before entering the town. Looking toward Miri, Valan and the others she said “I guess the Inn is not going to be our first stop. Looks as if we are going to have to work for our rest”. Fenella steps quickly toward the mother who is fighting for the lives of her family. She yells out over her shoulder “someone make sure they are safely out of danger” gesturing back at the family fleeing. She stops a distance behind the mother and cast Produce Flame. 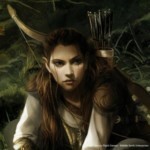 As the woman’s desperate plight was revealed, Miri’s bow was out and an arrow knocked without the ranger having even to think. A skilled eye measured the distance, aim adjusted to fit and she let an arrow fly, whispering the words to a spell as she does so. (OOC) Aiming at the one most in the back, Miri will use lightning surge with her storm bow. This reply was modified 7 months, 1 week ago by Mirilandil. The kobolds turned to Brother Roc and let out their hatred with an angry hiss as he tried to spoil their sport. Their rage came to a boil as they saw one kobold fall dead before them at the swords of the monk. Spittle bubbled from their reptilian jaws as their eyes burned into their new focus. Then Fenella’s ball of flame struck another kobold down and their attention was interrupted once again as the six remaining creatures turned to face the group approaching from down the road. A look of confusion and uncertainty quickly flooded their faces as their fun sport turned into a moment of fear and death. Another lizard creature dropped dead with Mirilandil’s arrow in its chest. A cracking surge of lightning danced over the body for a mere moment before arcing out into two more kobold’s standing next to him. They screamed in pain as they dropped their crude short swords to clutch at their chest. The remaining three kobold’s faces turned to horror as they turned to flee leaving their dead and wounded behind. This is just a rather informal battle so there was never any roll for initiative and no battle map that I usually use. I am giving you, the players, more creative licence to pretty much call the shots since kobolds are pretty weak. The 3 running away can easily be stopped or killed before they get away if you wish, I won’t even make you roll for it. In the future there will be more challenging fights and we will use combat rounds, and there will be a battle map. A slight smile appeares on Fenella’s face as she observed the stranger for a second as she readies another Produce Flame and sends it hurrliling into the back of one of the Kobolds that are now facing the male human who had struck down their companions. As the Kobold dropped to the ground Fenella moves toward the woman standing in the road holding a shield. She says to the woman,”go find your family quick before anymore of these creatures come from the dark”. Looking toward the stranger she smiles then looks to Miri and shakes her head with a knowing smile, this is someone that they need to talk to. She watches as Miri and the stranger take down the last two. “Did Valan take the family to safety”? she ask Miri looking to see where the rest of the group was. “And I don’t see Jefaris or Venali either, they must be fighting their own group of these lil beast”, she says scanning the area for her friends. OOC: I’m assuming that Miri and Roc will take out the last two. And just where is Valan at since he did not participate in this epic battle? This reply was modified 7 months, 1 week ago by Fenella. 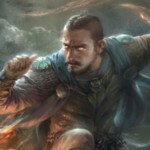 “We are here,” Valan answered as he caught up to the rest of the group with Venali and Jefaris behind him. “We spotted another group across the field to the west towards the river on the next street over. I am pretty sure they spotted us but they barely gave us a glance and kept heading down the street. Anyway it looks like you had this well under control,” Valan concluded. “They just showed up out of nowhere,” the woman added. The injured man and the three children with ages ranging from 5 to 12 rejoined the woman seeing that the immediate danger had passed. His limp had not allowed him to move very far in the short span that the fight had lasted. The woman dropped her broken spear and picked up a crude shortsword left by one of the dead kobolds as the youngest child, a boy of about 5 years of age, moved to her side and latched on to her leg. Two kobolds, alive but wounded by Mirilandil’s lightning surge, laid still upon the ground with eyes blinking rapidly in terror. “Please. No kill,” one said in a raspy voice as eyes fell upon him. “No kill. No kill. No kill,” he kept repeating as he pulled his open palmed hands back against his chest in a gesture of surrender as his tail curled around his leg. When the three remaining kobolds tried to flee the newcomer took chase immediately. With his speed he easily overtook one of them and ended its rampage with two blades jammed into its back. Satisfied the immediate threat to the family was over, he turned back to where they were sheltering under the protection of the travellers. He returned Fenella’s smile with a gentle nod of his head, and to Miri he returned the introduction in a pleasant voice. “Warm hearth and tidings, Miri. You may call me Brother Roc.” As the others came up and began speaking he stooped to wipe his blades clean on the rags that partially covered one of the kobolds. When its neighbour stirred and spoke he sprung back, surprised that any were still living. “Stand back,” he warned the family, holding an arm out protectively to ward them from the enemy. He looked upon the kobolds with little sympathy in his dark eyes, and then picked the most vocal. 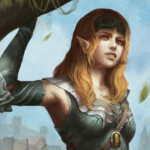 Miri shouldered her bow and made her way to the two kobolds. Without a word, she took out her sword and with one swift thrust, ended the murderous existence of the kobold not addressed by the monk. I gave you a merciful death, she thought. That’s much more than you gave these villagers. Wiping her sword off on the rags of the dead, she sheathed it once more and stood quietly, expressionless, awaiting the remaining kobold’s response to Brother Roc. “We follow orders. Gather treasure she says. For Rezmir. No kill us. 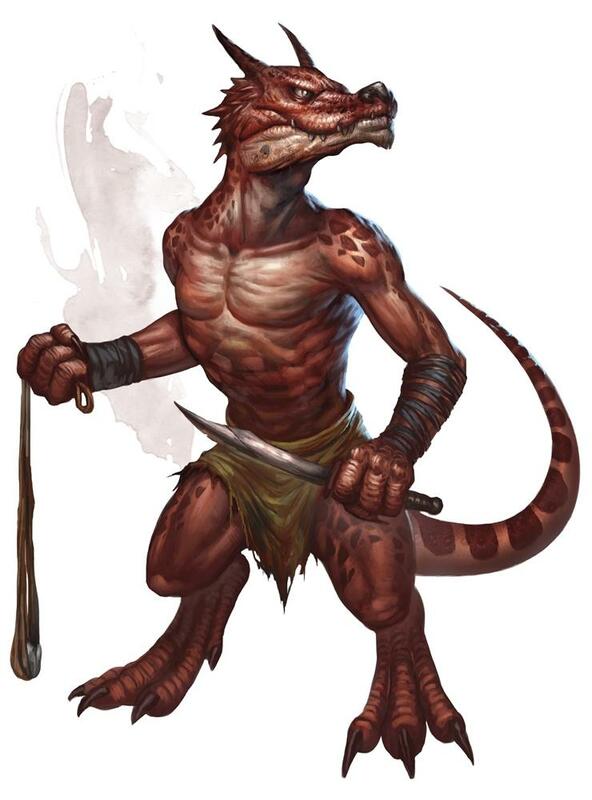 No kill…” as the kobold looked to his dead companion his tail tightened around his leg and he pulled his arms in tighter. His body shook with fear. The woman looked at the creature coldly knowing that it along with its companions would have killed her and her whole family if they had not been stopped. She doubted any plea of mercy on her part would have saved them. Fenella again smiles to Brother Roc and introduces herself. “Hello Roc, I am Fenella. This is our first time to this town, are you from here?” She waits for a response then looks to the Kobold lying on the ground. “Do you think he can add anything to help us or are you satisfied he has spoken all he has to say?” Fenella addresses the group. Standing over the Kobold she Produces Flame, holding it in her hand ready to end the creatures life. Pulling her water skin from her shoulder she drinks some of the water saving enough for another drink, and says “we could use some fresh water, and maybe a hot meal sometime soon. And it would be nice to gather around a table to discuss what our next move will be now that we have come across this invasion of the town. Also it would be nice if Brother Roc would join us and fill us in on what this invasion is, and who the ‘Purple Lady’ is if in fact he knows himself”.